Matt was gone for five days earlier this week, to visit some old friends and attend a memorial for that dear child that I was telling you about. His absence coincided with what will ideally be the last of the unpleasant wintry weather that we'll see until next winter, and so our time without him wasn't what I'd call super-fun, exactly. 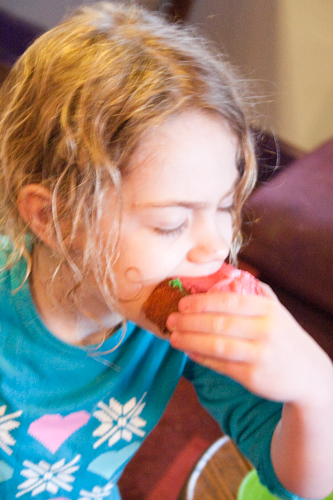 Sydney, acting out proven coping methods for her gender, requested that we bake a different sweet together just about every day. We baked muffins, and vegan cocoa fudge cookies, and, with pretty much the last dregs of the pantry supplies, a heart-shaped cake. 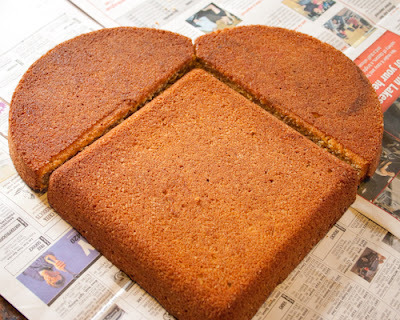 You can use any standard cake recipe for a heart-shaped cake. I used the 1-2-3-4 cake from The Art of Simple Food , with an absurd number of substitutions due to the oddness of our pantry (I try to shop only every other week now, due to the oddness of our budget, you could say, so it's typical for recipes to turn odd after a week or so). Let's see...I actually used the eggs that the recipe called for, even though I don't normally eat eggs, because Matt eats them and he wasn't home TO eat them. Instead of milk I used the rest of the organic cow's milk yogurt and then the rest of the soy yogurt--together they came to exactly the right amount, yay! Instead of cake flour I used organic, unbleached all-purpose flour. Instead of the butter I used the rest of the homemade Mason jar butter that the girls and I made earlier last week, and Earth Balance. Despite the way it sounds, the cake came out excellent--perhaps slightly on the dry side, which made it perfect for picking up and eating out of hand, which we all prefer, anyway. 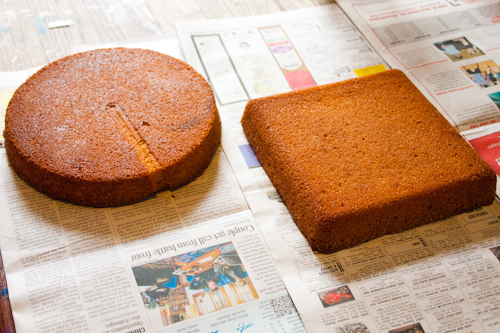 The length of the side of the square pan should be equal to the diameter of the round pan, although it can be a little smaller, if you just don't have the right pans--for instance, I bake these cakes in a square 8" casserole dish and a round 9" cake pan. 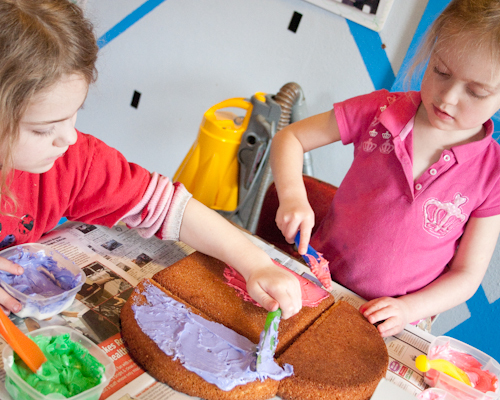 I'll show you how to trim the cake later if you do that. 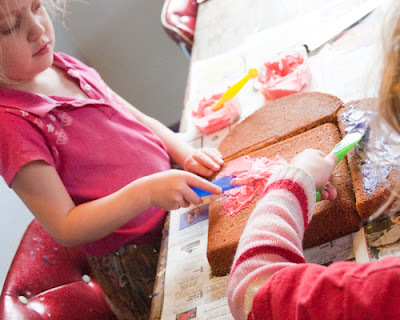 The other option is to bake the square part of the cake in a rectangular cake pan and just cut it down, but that method wastes some cake, and this method won't. 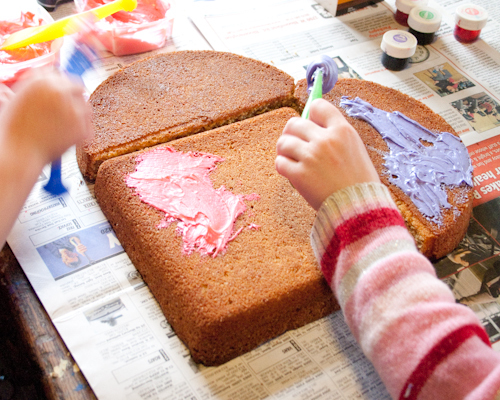 Heart-shaped cake! If the round cake was slightly larger than the square cake, then set each half-circle down independently, lined up correctly at the bottom, and trim the top straight up, the way that I did in the above photograph. 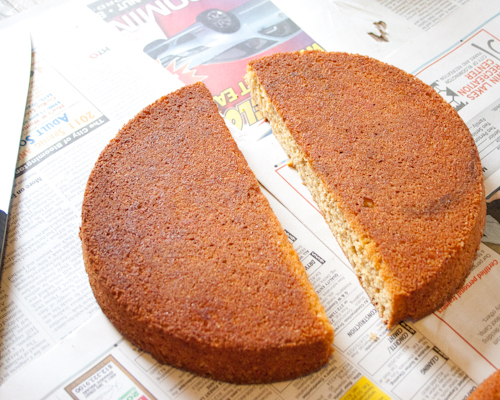 If your round cake is the smaller one, though, you'll mess up all the proportions, so just don't do that. I made a batch of vegan buttercream frosting from Vegan Cupcakes Take over the World --don't shame me, but I was almost out of Earth Balance and I didn't have cow's milk butter, so I used Crisco from the can that I'm saving to make soap with! 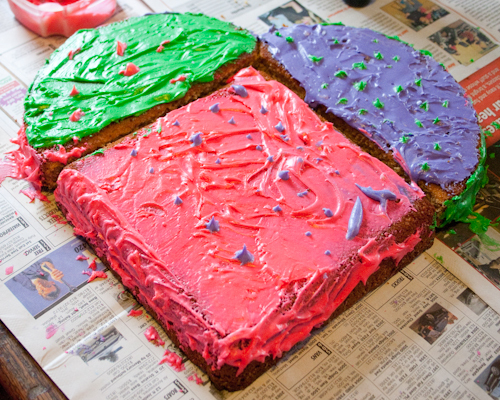 I don't regret it, though--that icing was perfectly white and pure-looking, and took food coloring gorgeously. I divided the frosting and let the girls each choose two colors--Willow chose purple and green, and Sydney chose two colors of pink that were practically identical, and refused to let me darken either one even a little. Now that's a very very good idea!